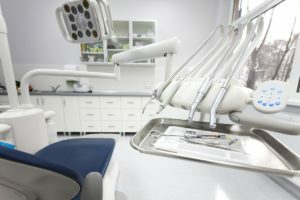 During a standard dental cleaning, a hygienist uses special instruments and techniques to remove bacteria and plaque between the teeth and along the gumline that can be missed with everyday brushing and flossing. However, some of our patients require a specific procedure, called a “dental deep cleaning,” that goes above and beyond a basic cleaning. A deep cleaning may sound invasive, but it is nothing to worry about. Read on as Dr. Samir Ayoub discusses why someone might need a deep cleaning and what the procedure entails. A sticky film called plaque constantly forms on the teeth; if it isn’t removed by brushing and flossing, the bacteria in the plaque can inflame the gum tissue. Healthy gums hug the teeth snugly, but inflamed gums pull away from the teeth, forming spaces or “pockets,” which can harbor even more bacteria. During a regular cleaning, a hygienist will use an instrument called a probe to measure the area around the teeth, including any gum pockets. This is virtually painless. Ideally, the depth of the pockets should be 3 millimeters or less. Pockets that are greater than 5 millimeters are problematic, indicating the early stages of gum disease. At this point, a basic cleaning is generally unable to reverse the problem and restore the gums to good health. Instead, a more thorough deep cleaning is required to clean the area above and below the gumline. If the early stages of gum disease are left untreated, it can advance, gradually destroying the structures that hold the teeth in place. A deep cleaning is the first step toward rehabilitating the gums and avoiding serious complications from gum disease. There are two parts to a deep cleaning: scaling and root planing. Scaling involves removing the plaque and tartar (hardened plaque) above and below the gumline. This can be achieved using a manual or ultrasonic cleaning instrument. Root planing is the process of smoothing out the tooth roots so they can properly heal and reattach to the teeth. Sometimes, a local anesthetic is used to minimize discomfort during a deep cleaning. Certain deep cleanings also involve applying antimicrobial medication below the gumline to kill bacteria. At the end of the deep cleaning, the hygienist can go over at-home practices to help restore the gums to optimal health. Another appointment is scheduled to check the gum tissue’s healing and measure the pockets. If the pockets have not gotten smaller, additional treatment may be recommended. The best way to maintain healthy teeth and gums is to brush and floss daily, eat a healthy diet, not smoke and see your dentist regularly for cleanings and exams. If you are due for an appointment, please call or email our San Francisco office today.